AirLink® LX40 delivers secure, managed connectivity for IP cameras, security, smart lockers, point-of-sale terminals and industrial equipment with LTE (Cat-4) or LTE-M (Cat-M1)/NB-IoT (Cat-NB1). Sierra Wireless, today announced the AirLink® LX40, the industry’s most compact cellular router for the IoT. AirLink LX40, with LTE and LTE-M/NB-IoT variants, provides secure, managed connectivity out of the box for business-critical IoT and enterprise applications. LX40 supports data processing at the edge and is ideal for connecting cameras, smart lockers and point-of-sale terminals, as well as industrial remote data logging and sensing equipment in indoor or protected-outdoor locations. Today’s global businesses are rapidly undergoing a digital transformation by connecting their equipment, offices and stores to deliver service-oriented business models that increase efficiency, revenue and customer satisfaction. AirLink LX40 is purpose-built to enable this transformation, providing LTE and optional Wi-Fi connectivity, combined with trusted AirLink networking, routing and security. Sierra Wireless also provides a complete portfolio of AirLink Network Management tools, available in the cloud or on premises, for remote monitoring, configuration and control of all connected AirLink routers and gateways. With LX40, businesses can rapidly and confidently deploy high-volume IoT applications that easily scale from tens to tens of thousands of networking devices. 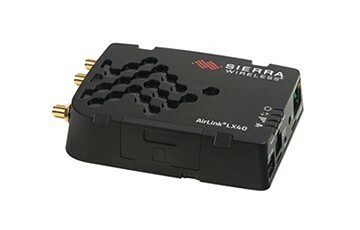 AirLink LX40 is part of Sierra Wireless’ new AirLink Essential Series of routers and gateways. It is available in two variants: LTE-M/NB-IoT (up to 300 Kbps downlink) for enhanced coverage and LTE Cat-4 (up to 150Mbps downlink) for higher throughput. The LX40 features a single Gigabit Ethernet port to provide primary LTE connectivity, with support for PoE (Power-over-Ethernet), which further simplifies installation. The available I/O port and built-in embedded application framework allow for simple machine connectivity and edge processing. The LTE Cat-4 variant is available with an optional Wi-Fi feature, making it ideal as a hotspot or to access building Wi-Fi infrastructure. AirLink LX40 models are priced at $349 for LTE-M/NB-IoT, $399 for LTE Cat-4 and $449 for LTE Cat-4 with Wi-Fi. LX40 LTE Cat-4 variants are sampling in August 2018 with commercial availability beginning in September 2018. LTE-M/NB-IoT variants are sampling in September 2018 with commercial availability beginning in October 2018. AirLink Networking Solutions are sold through Sierra Wireless’ authorized channel partners worldwide.